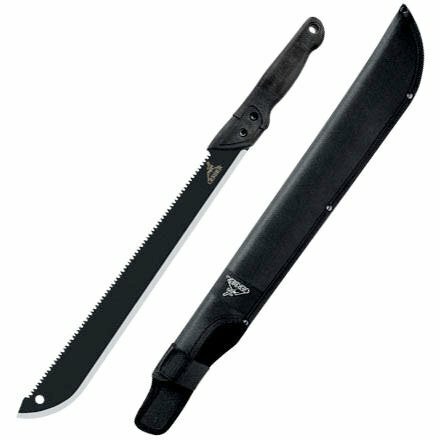 The Gator Machete wields a huge 65.3cm fine edge blade on one side, a 45.7cm high performance saw blade on the other, and our proprietary Gator rubber grip for ergonomic control while using either. The riveted nylon sheath provides safe, durable transport. 15.75" Overall with a 10" sharpened stainless blade almost 4mm thick. Full tang with black hardwood handle and lanyard. Complete with nylon belt sheath. Full Tang Handle Wrapped with Black Nylon Cord for a comfortable grip. Sheath: Black Nylon With Harness. 24.5" Overall with a 3mm thich, sharpened, stainless blade with sawback and two tone finish. Full tng with orang and back injection handle with lanyard, complete with nylon belt sheath. 21.25" overall. 15.25" sharpened finish 1055HC steel blade. Full Tang, Brown wood handle. Made in South Africa, Great garden workhorse. 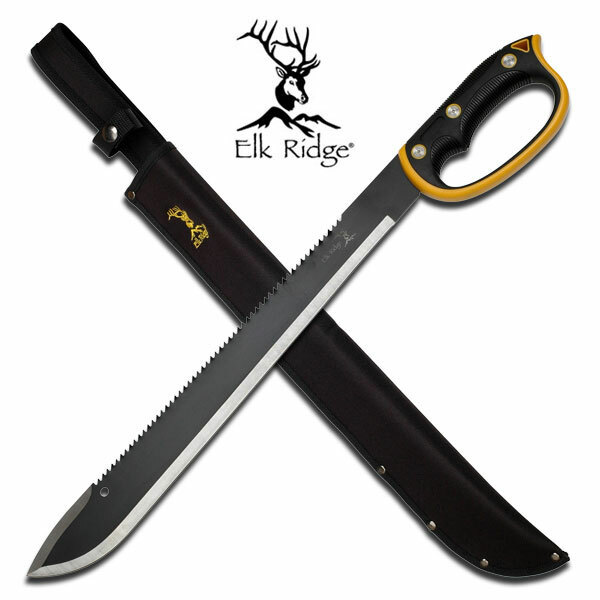 15" Overall with a 4mm, 10" sharpened, stainless blade with file worked spine, hardwood handle and stainless steel fittings, complete with leather belt sheath, great looking item.